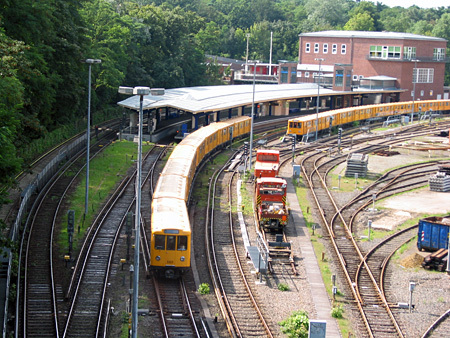 Small-profile line with ~105 m long platforms (8-car trains of A3 and GII stock, or double 4-car trainsets of HK stock in service). 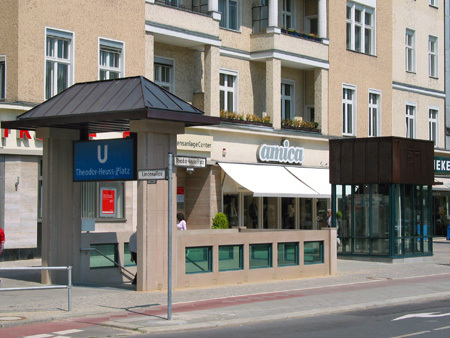 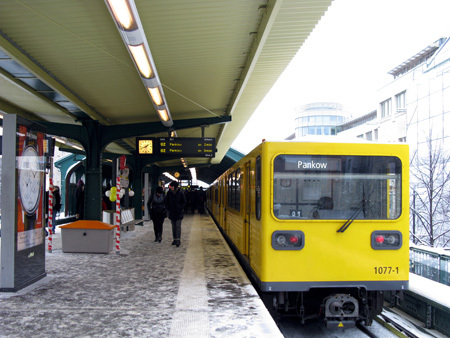 At the western end of line U2, every other train terminates at Theodor-Heuss-Platz during daytime service. 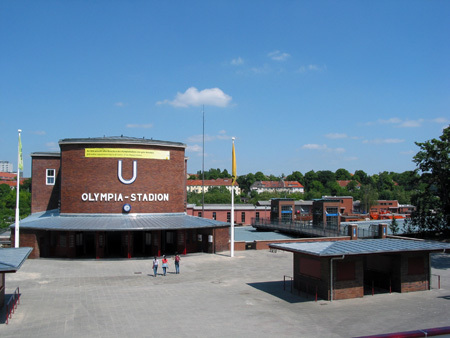 From Ruhleben, line U2 runs on an embankment to Olympia-Stadion, past the main workshops for the small-profile rolling stock. 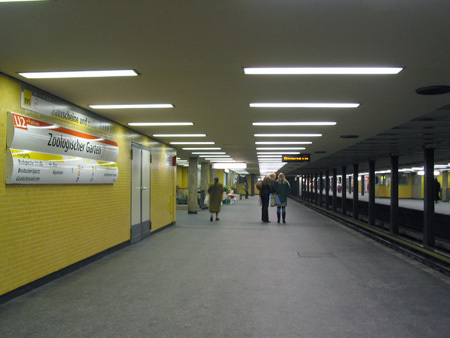 Just after Olympia-Stadion station, trains enter the first tunnel section, which runs through the district of Charlottenburg to a point between Wittenbergplatz and Nollendorfplatz. 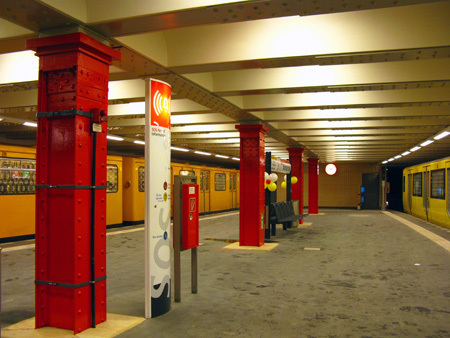 The section between Ernst-Reuter-Platz (formerly Knie) and Potsdamer Platz is part of the original U-Bahn opened in 1902. 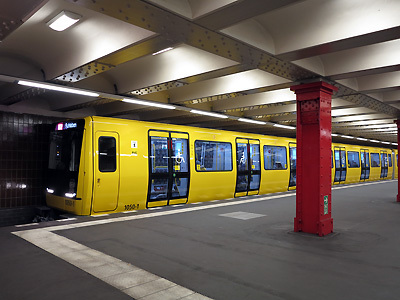 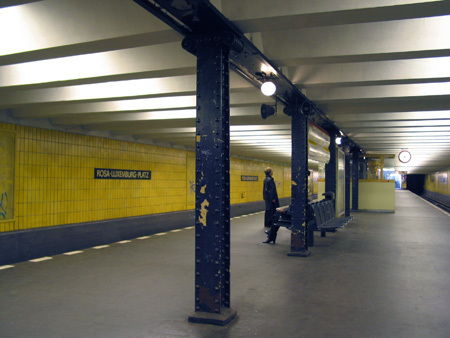 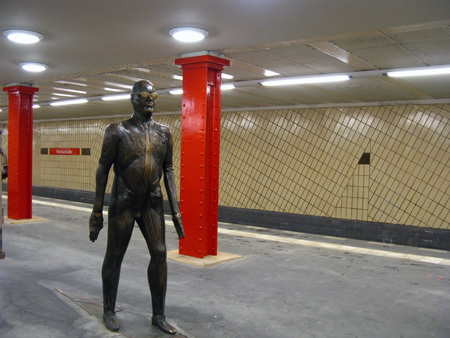 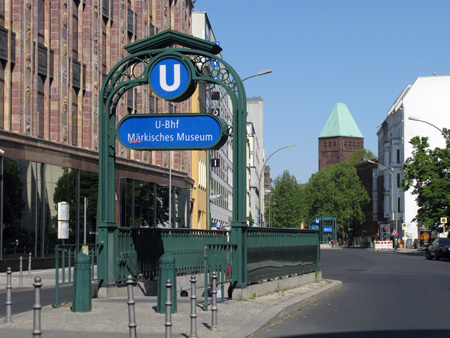 From 1906 until 1970, there was a branch from Deutsche Oper to Wilhelmplatz (now Richard-Wagner-Platz), a section later replaced by the present line U7. 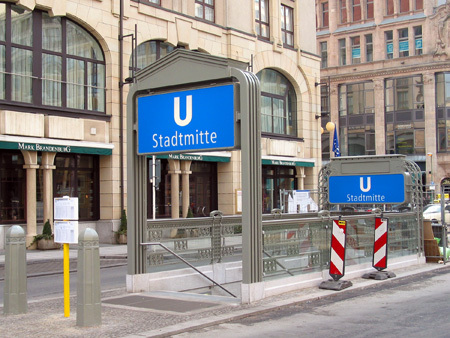 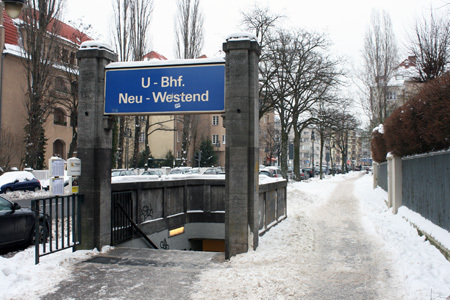 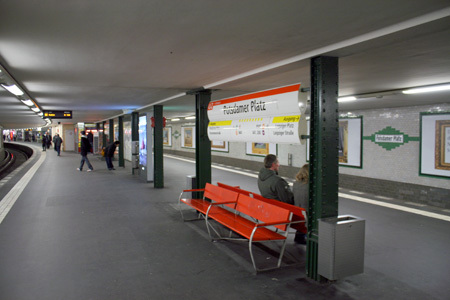 The next underground section starts right after Mendelssohn-Bartholdy-Park, with the ramp completely covered in 2009. 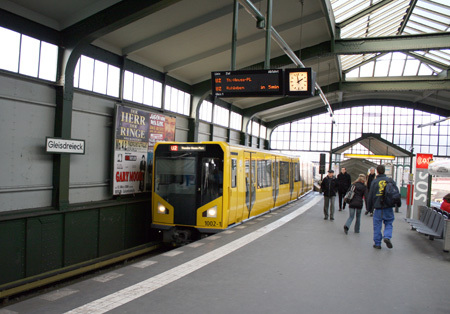 The line winds its way through the city centre on a rather indirect route, as Leipziger Straße was the domain of the urban tramway lines. 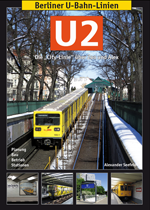 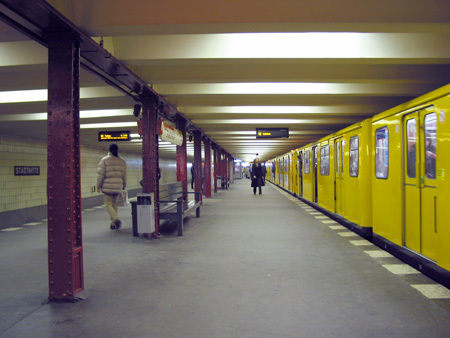 North of the Mitte district, line U2 emerges from the tunnel to continue on an elevated structure along Schönhauser Allee in the popular district of Prenzlauer Berg, before re-entering the tunnel between Schönhauser Allee and Vinetastraße stations, the latter remaining the northern terminus from 1930 until 2000, when the line was finally extended to Pankow S-Bahn station. 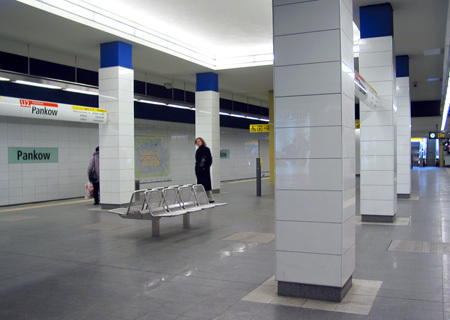 What is now line U2, was split into two separate lines when the Wall was erected in 1961. 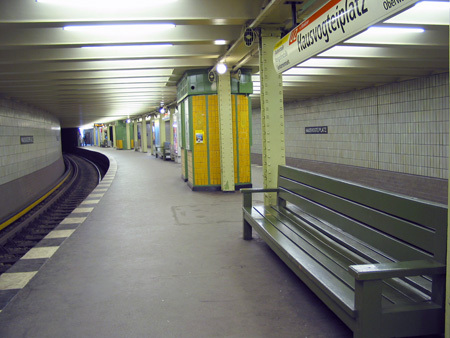 The elevated section between Nollendorfplatz and Gleisdreieck was out of service from 1972 until 1993. 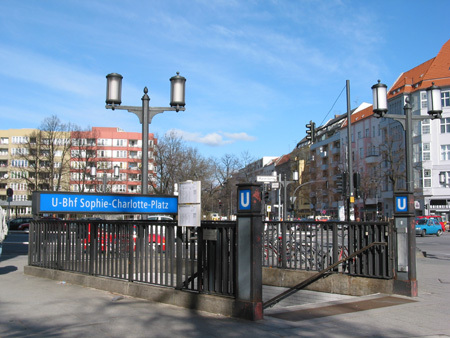 The section between Nollendorfplatz and Bülowstraße, however, was operated by a vintage tram for some years. 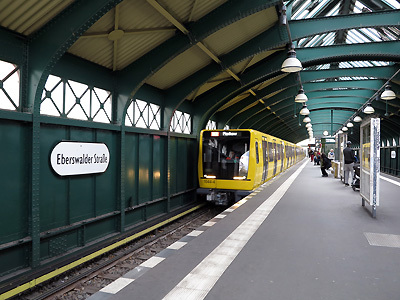 The lower level at Gleisdreieck was occupied by the trial service of the 'M-Bahn', a magnetic levitation system later dismantled to make room for the reconstruction of line U2 across the former borderline. 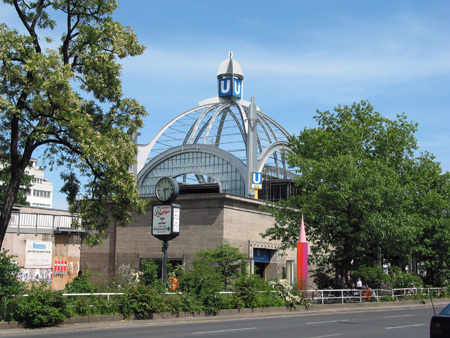 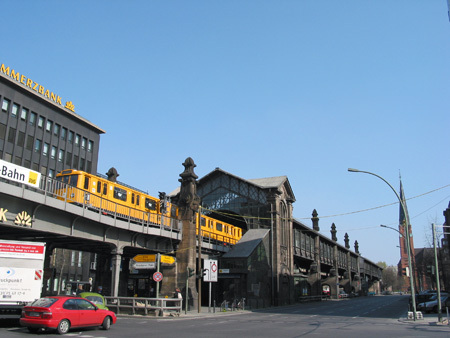 at grade; three tracks with two island platform; large entrance building, with U-Bahn Museum located inside former signal box. 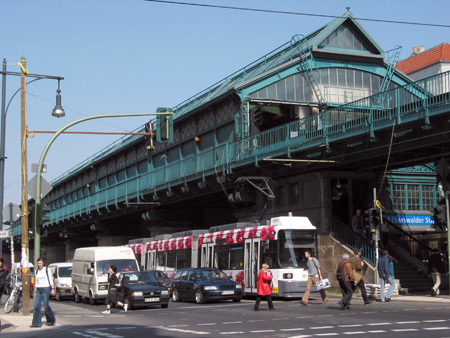 S-Bahn tracks, which are in a cutting, are crossed on a bridge, which is actually the lower level of the road bridge. 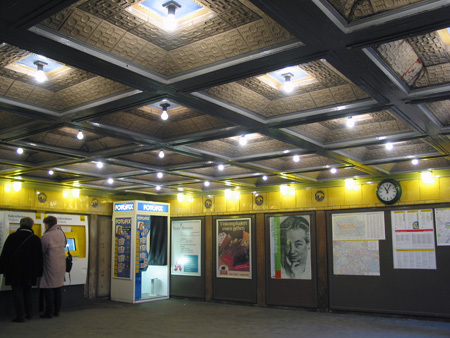 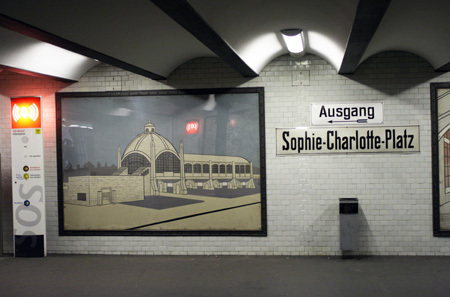 Rather original design, with walls later covered with images depicting old U-Bahn stations and trains; side platforms. 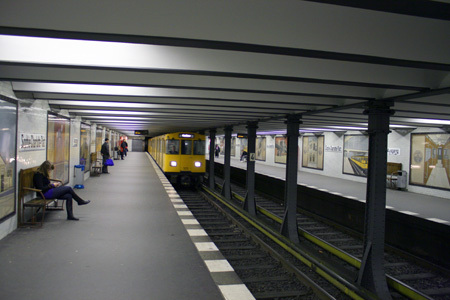 side platforms; station added to provide direct transfer to line U7 which runs on the lower level. 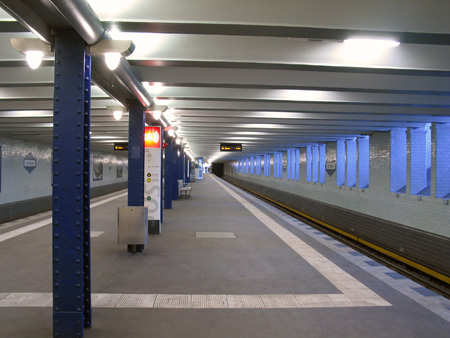 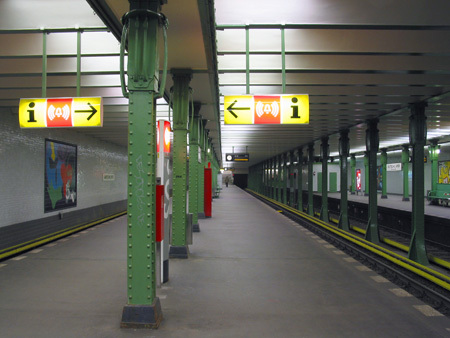 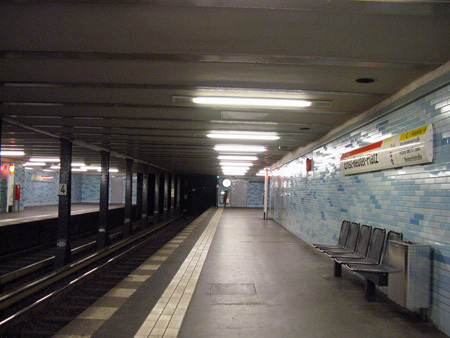 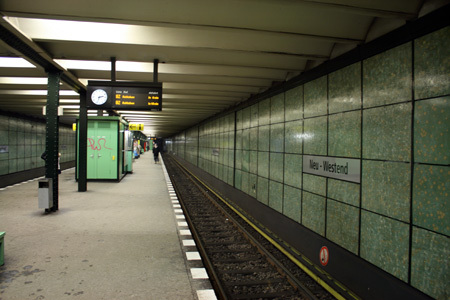 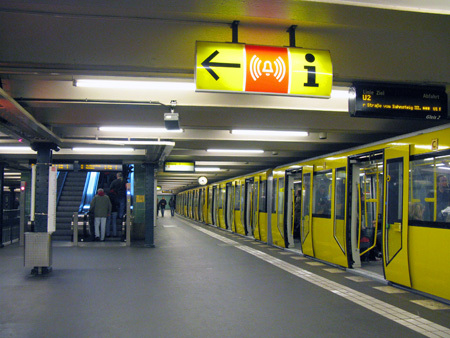 two island platforms, with line U2 only using the outer tracks; the inner tracks were used by trains going to Wilhelmplatz (Richard-Wagner-Platz). 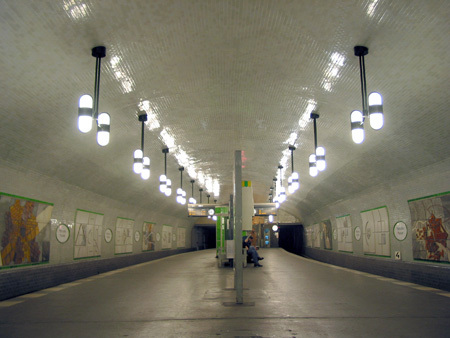 Restored to original design after a fire in 2000. 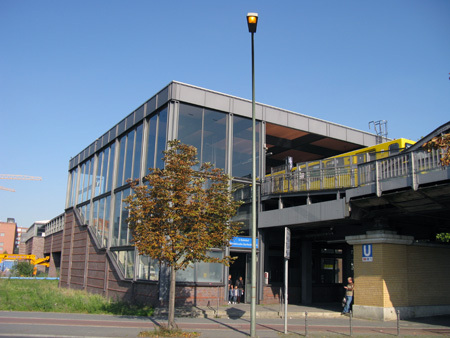 Slightly rebuilt in the early 1960s to create convenient interchange with line U9. 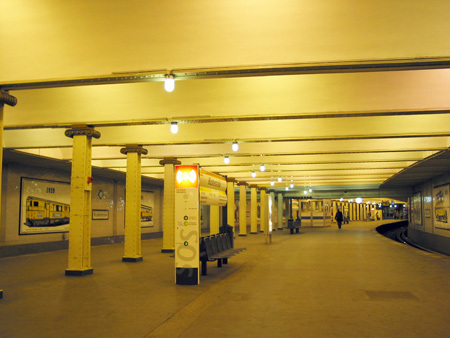 Located in the heart of City West, formerly busy mainline station. 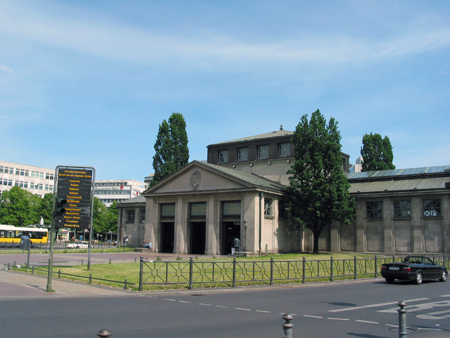 initially standard two-track station, but later rebuilt to accommodate the other two western branches, and enhanced with an outstanding entrance building. 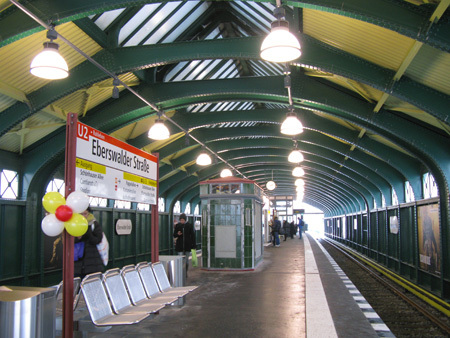 elevated station with side platforms; originally with a dome above the western entrance, which was rebuilt in a simplified form in 2002.
elevated station with side platforms; mostly preserved in its original style. 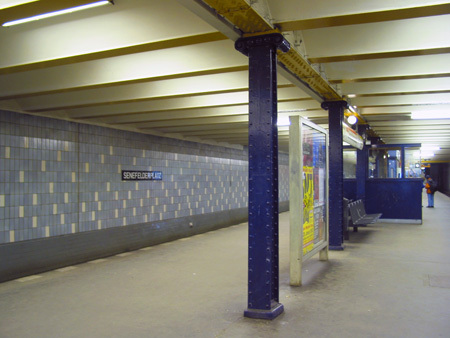 line U2 stops on the lower level of the 2-level station added on the site of the original triangular junction. 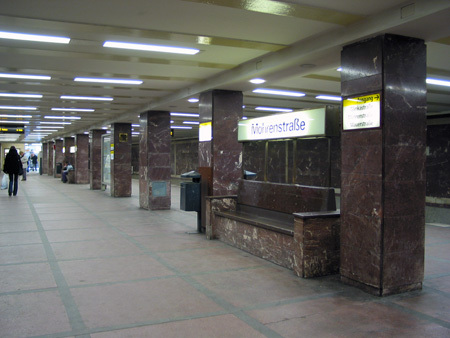 Original station (Berlin's oldest underground station) was demolished to allow for the extension into the city centre. 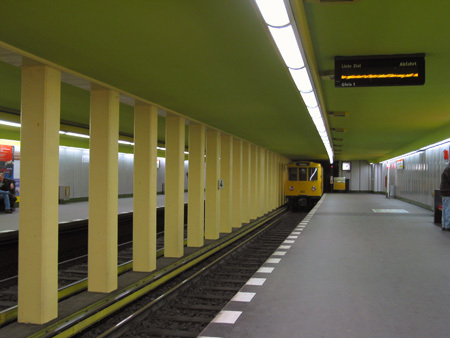 Closed between 1961 and 1993, though used for stabling trains from the eastern side. 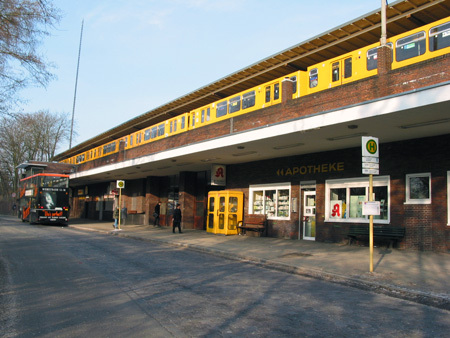 Terminus from 1961 to 1993 of East Berlin's only small-profile line. 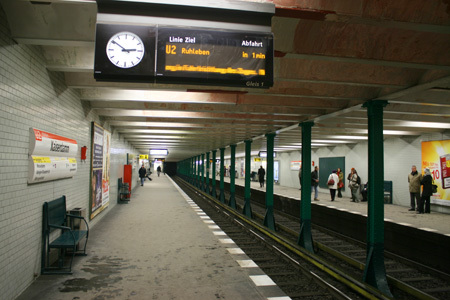 Long and narrow transfer corridor between lines U2 and U6, known as the 'mouse tunnel'. 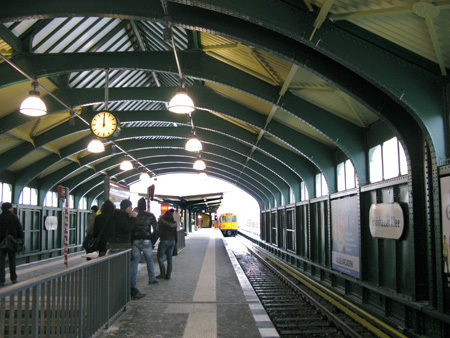 On the northern side, where the line lies directly side by side with the Spree River, several openings allow daylight into the station. 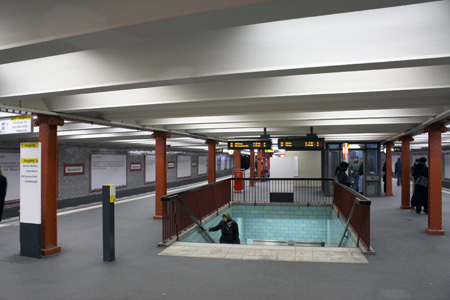 Due to the following river crossing the station is higher than usual and boasts a Paris-style vaulted ceiling without supporting pillars. 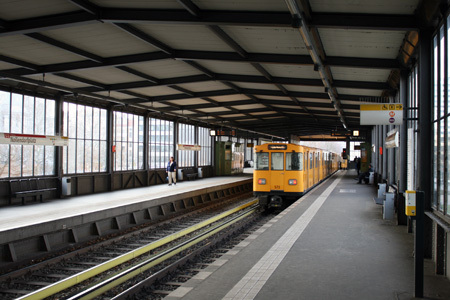 Originally laid out with three tracks in a provision for an eastern branch line, the island platform is unusually wide; converted into a kind of museum in 1987 with images illustrating historical transport vehicles, from buses to S-Bahn trains. 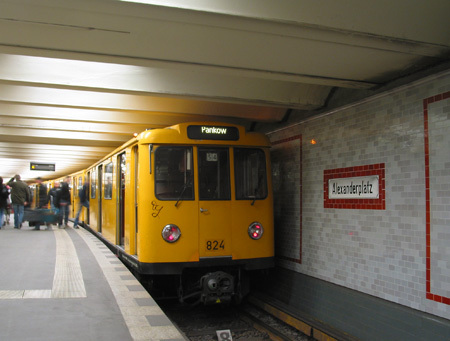 At the northern end, an original carriage from the Schöneberg U-Bahn (now U4) is on display. 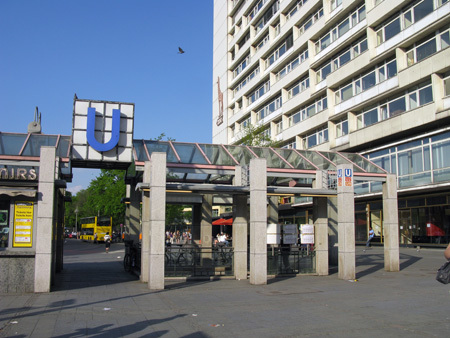 Eastern stroke of the H-shaped Alexanderplatz complex, including lines U5 and U8.